POW/MIA – Horace Orr Post 29, Inc. The Department of Defense Dpaa POW/MIA Accounting Agency announced today the return of (5) five U,S servicemen to their families for burial with full military honors and to bring closure to their loved ones. The POW/MIA meeting will be Saturday April 20th at 12:00PM. All are welcome. At a ceremony conducted in Da Nang on December 11, 2018, Vietnamese officials repatriated to Defense POW/MIA Accounting Agency (DPAA) representatives what are believed the remains of three Americans unaccounted-for from the Vietnam War. DPAA Deputy Director for Operations Rear Admiral Jon Kreitz led the U.S. delegation that participated in the ceremony during which DPAA Detachment Two Commander Lt. Col Adam Points officially accepted the remains.The ceremony is part of a two day visit that Kreitz is making to Vietnam to commemorate the 30th anniversary of sustained United States-Vietnamese Joint Field Activities (JFAs) that officially began in September, 1988, to account for U.S. personnel missing from the Vietnam War. All official activities for Veterans’ Day will be Saturday November 10th and Sunday November 11th. Join us for the parade at 10AM Saturday. Riding on the float is for members first come, first seated. Arrive early Saturday morning. The Veterans’ Day meal for current members (paid up ID card required) will be an Italian Feast served in the main hall upstairs at 2PM. We’ll have the pasta, sauces, meatballs, sausage, bread and salad. Bring a side or a desert to share. If you have a family recipe for something we already have, that is welcome too. Those who have said they would help cook/serve, please arrive anytime after 8AM. Sunday , Nov 11th at 11AM on Veterans Day, the American Legion Post 29 will hold a ceremony entitled “ Bells of Peace” at our post located at 921 Gresham Ave. NE, Marietta. There will be ringing of the “Bells of Peace “ 25 times with a 5 second pause. This ceremony commemorates and celebrates the 100th Anniversary of the ending of World War One. There will also be a short program. The public is welcome and encouraged to attend. Also Sunday Nov. 11th at 5 PM at our post there will be a flag retirement ceremony. This is also open to the public and we encourage you to bring American flags that are ready to be retired for proper disposal. 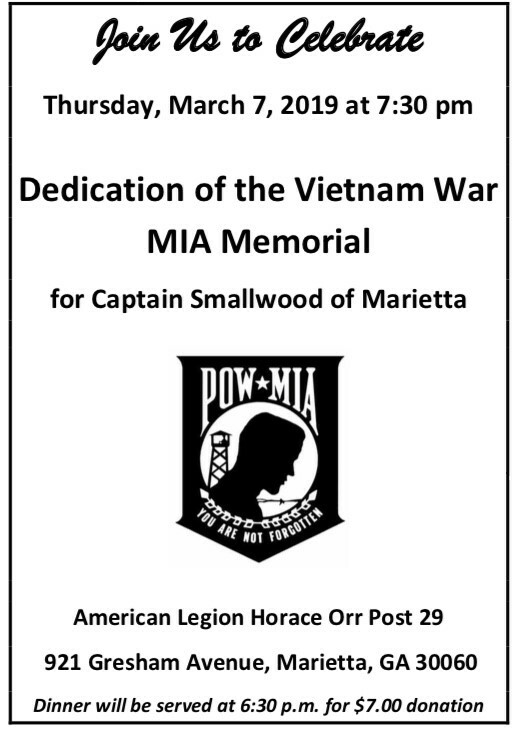 This event is being coordinated by the American Legion and the POW -MIA unit of post 29. The Department of Defense DPAA POW/MIA Accounting Agency announced the return of (6) six U.S. service men to their families for burial with full military honors and to bring closure to their loved ones. 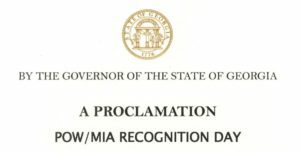 Today is POW/MIA Recognition Day as proclaimed by Governor Nathan Deal. The monthly meeting of the POW/MIA team will be held at Post 29 tomorrow (9/15) at noon. The Department of Defense POW/MIA Accounting Agency announced today the return of (8) eight U.S. servicemen to their families for burial with full military honors and bring closure for their loved ones. The Department of Defense POW/MIA Accounting Agency announced the return of (15) fifteen U. S. servicemen to their families this week for burial with full military honors and to bring closure to their loved ones.